Home > Live Jazz Shows > The CJO with Allen Toussaint and "New Orleans on Parade"
The CJO with Allen Toussaint and "New Orleans on Parade"
The Jazz Arts Group of Columbus (JAG) will let the good times roll as the Columbus Jazz Orchestra opens the 2010-11 Swingin’ at the Southern season with New Orleans on Parade (October 27-31). Join in the festivities as the party transforms into an unforgettable Mardi Gras celebration with the “Southern Knight” himself, Allen Toussaint. In a career that has spanned nearly half the century, Allen Toussaint has exerted an unparalleled influence over the music of New Orleans. His massive influence on American music reaches deep into the idioms of rhythm and blues, pop, country, musical theater, blues and jazz. He has produced, written for, arranged, had his songs covered by, and performed with music giants The Judds, Paul McCartney, Paul Simon, Elvis Costello, Patti LaBelle, Mac “Dr. John” Rebannac, Aaron and Art Neville, Joe Cocker, The (original) Meters, Glen Campbell, The Band, Little Feat, The Rolling Stones, Devo, Ernie K-Doe, Lee Dorsey, Irma Thomas, Etta James, Ramsey Lewis, Eric Gale and countless others. 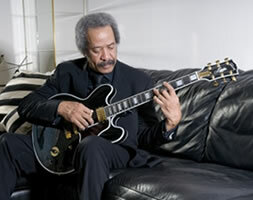 After establishing himself as one of the greatest songwriters, accredited to him by BMI Music, Toussaint was inducted into the Rock and Roll Hall of Fame in 1998. The most recent of Toussaint’s long list of honors and accolades is the Grammy-nominated pop/vocal album of the year, The River in Reverse; Toussaint’s collaboration with Elvis Costello. Since Hurricane Katrina, Toussaint has started to tour and perform before a whole new audience. The truly amazing part is there’s more to come. Toussaint will also be featured on the upcoming Eric Clapton release, Clapton, (“My Very Good Friend the Milkman” and “When Somebody Thinks You’re Wonderful,” both with Trombone Shorty and Wynton Marsalis), and Treme: Music from the HBO Original Series: Season 1 (“Time Is On My Side” with Irma Thomas). Season subscriptions are available through the CAPA Ticket Office at 39 East State Street or by calling 614-469-0939. Single tickets are also on sale now for $49 (main floor), $46 (first balcony) and $41 (second balcony) and available by phone at 614-469-0939 and through all Ticketmaster outlets. For more information call 614-294-5200 or visit www.jazzartsgroup.org.